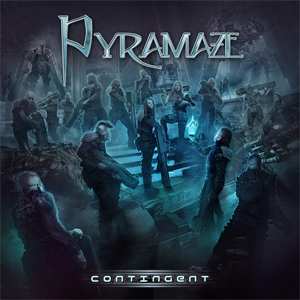 The melodic metal band PYRAMAZE just released a music video for the track "A World Divided" from their new album Contingent. The album will be released on April 28th in Europe and North America through Inner Wound Recordings. With their milestone fifth album Contingent, PYRAMAZE have grown and matured into a band that is capable of satisfying their fans while simultaneously continuing to break new ground. The incorporation of modern cinematic film score elements mixed with progressive metal riffs and melodies will leave the listener breathless! Huge, sweeping, hard-hitting, and poignant, Contingent is an epic post-apocalyptic conceptual piece inspired by current events, the human spirit to overcome struggle and diversity, and the brotherhood that lies there in. Produced, mixed and mastered by Jacob Hansen [VOLBEAT, AMARANTHE, EPICA, EVERGREY]. "Divided by oceans, bound together by brotherhood, we must become that which divides us.... we are PYRAMAZE, and we are the Ocean!" "Contingent - Part I: The Campaign"
"Contingent - Part II: The Hammer of Remnant"
"The Tides That Won't Change"